One of Charlotte Mason’s most popular tenets is that children do not have a natural affinity for twaddle, which includes second rate, predictable stories, dry compilations of others’ ideas, and incomplete textbook summaries. Just as it is our job as parents and teachers to feed our children’s bodies, it is our responsibility to nourish their minds with living ideas found in what Charlotte termed living books. 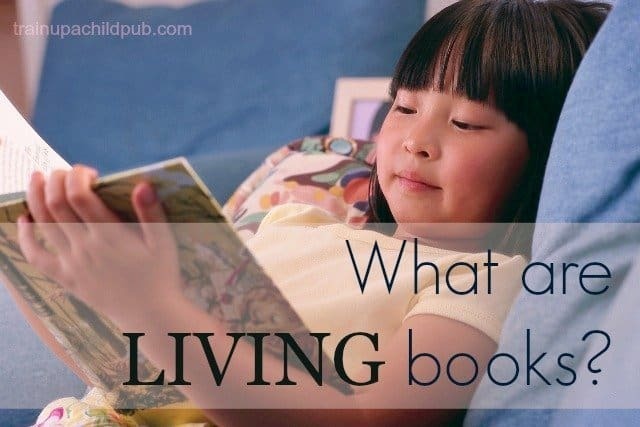 Charlotte Mason described living books as bursting with vital, vivid ideas written by authors who are passionate, knowledgeable and obviously fascinated by their subjects. These books have noble ideas and often heroic characters. Facts are usually combined in these works with fiction, and by that I don’t mean “made-up” information, I mean, a story. What young reader’s attention is not captured by a fascinating story? All the better when the story contains or is based upon factual information and is accompanied by detailed, accurate illustrations. Along with a large segment of homeschooling parents today, Charlotte and many of her devotees believed that living books should have a preeminent place in children’s education. Charlotte observed that children had a natural affinity for literature and were distinctly susceptible to picking up living ideas from well-written, living books. Interestingly, she also thought that our place as teachers should be ‘second place’ to children experiencing a book themselves. Not only with books, but we should take a back seat when children study nature, artwork and music, as well. First, children are to interact, or develop a relationship with, the book, tree leaf, painting or sonata. Then, they are to narrate (we will deal more with this in a later post), or tell back, what they observed, learned or thought about the work. Only then may we discuss our thoughts with them on the subject. Giving them time to reflect on the object before we add our two cents is certainly contrary to many classrooms wherein students are expected to listen all day to “pre-digested” information in the form of teacher’s lectures. We remember what that is like, don’t we? Did Ms. Mason believe living books were useful just for literature studies? Absolutely not! Living books are appropriate for most children’s subjects, and should be included in many areas, including history and science. Johnny Tremain and RIFLES FOR WATIE . Science – Often considered a science book, The Librarian Who Measured the Earth contains fascinating historical details and describes a higher level scientific/mathematical concept in language that can be understood by an elementary school student. Like so many living books, this one can be considered as doing ‘double duty’ and can be used not only for science, but also for history, math or even geography. Fine Arts – Add well-written biographies of musicians, artists, books about the history of instruments or how they are created, or about how different cultures express themselves in fine arts. Charlotte would probably have you expose your children to the literature, art or music prior to reading the book, though. Geography – Read stories that take place on the plains of Africa, in the rainforests of South America and the bleak tundra of the Antarctic and use maps, globes and other activities, after written and oral narrations, to fill out and solidify the knowledge gleaned. Reading about missionaries and about explorers are other ways to include living books in your geography studies. Check out Shipwreck at the Bottom of the World: The Extraordinary True Story of the Shakleton Expedition for an exciting story about Antarctica! If you haven’t already, whether you use a literature-based curriculum or not, we recommend you making a large place in your school day for an abundance of whole, living books, as Charlotte Mason did with her students. Time to put away the predictable series books, the teenage romances (please!) and the dry textbooks (unless they are used as references or to fill in here and there.) Liven up your homeschool and give your children the gift of enjoying learning. Thanks for your comment! We love books, too! If you would like many other suggestions for living books, you can look on our Books! pages from https://trainupachildpub.com and see the books we used for our lesson plan curricula. I hope that is helpful to you! We love books! I am finding this year some great living books for science. Thank you for your recommendations.